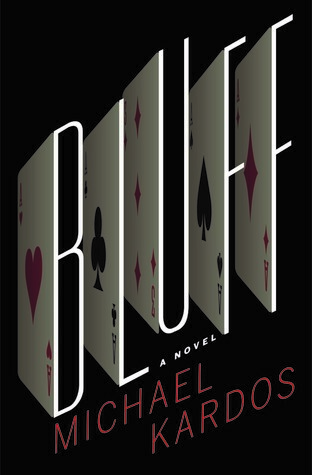 money – Russ Madison, Jr.
Michael Kardos’s Bluff is an absolute delight. Natalie maims a volunteer at her magic show in a priceless scene, but it’s Natalie we feel bad for. Surrounded by jerks, she’s the victim of repeated unfortunate circumstances for which she is totally innocent or only partly blameworthy. Falling deeper into a hole, she shifts from honing her craft as a professional magician to learning about card sharps. This sets in motion a suspenseful series of events leading up to a million-dollar poker match. In the process, Natalie teams up with Ellen, a woman with great technical skill at the poker table who offers Natalie mentorship as well as a glimmer of friendship that seems to be missing from her life. The descriptions of magic acts and card sharping are presented with such enthusiasm and intrigue that they are 100 percent compelling, even though I don’t even care about those topics in the real world! The details reach out and grab you by your throat with their authenticity. Kardos’s heartfelt and precise language elevate the novel above typical genre fiction. Also, I loved the sense of humor in Bluff, especially in the beginning and in the middle before things became more serious. Kardos is able to present information in a very funny, succinct, and descriptive way. It’s not the zany, confrontational humor of Carl Hiassen–it’s much more economical and subtle. Even though I’m not a magician, a gambler, or a woman, I felt connected to and very invested in Natalie and her plight. Some books take me months to finish because I lose interest, but this one I gobbled up in three days. I even stayed up late to finish, which I can’t remember doing with any other novel ever! But it turned out that I wasn’t sold on the ending, otherwise this would have easily earned five stars for the wonderful language, humor, character development, compelling details, and near-Hitchcockian suspense. What an underappreciated storyteller was John Reese. In some ways an heir to James Cain and Dashiell Hammet, Reese was able to create visceral plots infused with palpable greed, criminality, and menace in sunbaked California landscapes. The Looters (1968) was billed on some book covers as “The exciting and violent story of a bank robbery.” Indeed, the book includes such a story, but that doesn’t do it justice and the story doesn’t end there. The Tres Cruces National Bank isn’t exactly as clean and pure as the wind-driven snow. Investigators initially suspect that the robbery was an inside job orchestrated by somebody within the shadowy, mostly Italian owned parent entity that controls the bank. Everybody loves money, but few people like numbers or financial complexity. Even fewer can tolerate reading about the subject. Reese is one of those rare authors who is able to convey a complicated financial caper to thrill his readers rather than crossing their eyes. He did it with Two Thieves and a Puma and again with this book. His quirky characters and their motivations are what carry the readers through the turning points in his plots. Reese also usually takes time to explain what the financial interests of the different players are so readers don’t get lost. Schirmer put down the phone and shouted for Eddie. The chauffeur had slept in the lounge outside, and was still not dressed. ‘I been waiting to hear you was awake, Mist’ Schirmer,’ he said. The Looters is filled with deliciously nasty dialogue like that, and characters like Schirmer who show their cruelty, caprice, and superiority complexes at every turn. Molly, a hired gun working for the Italians, is a world-class sadist and creep tasked with hunting down the bank robber before law enforcement gets him. They are all harsh to take, but fun to read about. The downside to the host of characters is that there isn’t a single antagonist or a single hero. There are good qualities and bad qualities on all three sides of the character triangle: the bank robbers, the bank owners, and law enforcement. The lack of a single main character gives the book a different style and impact than the movie, which focused on Varrick (and made him more genial than the hard and ruthless robber in the book). Reviews of this book have noted that the ending is different from the movie. That is true, and in several ways, the film’s ending is superior to the book. The memorable biplane chase from the movie is nowhere to be found in the book. Whoever came up with that idea for the movie deserves credit for the exciting addition, which was quite sensible considering that Charley Varrick and his partner were crop dusters in the book. The book’s ending was jarring. The scene where Molly finds Charley occurs too suddenly, with very little build-up. It would have been improved if Molly had to chase a few more leads prior to finding Charley, and if their physical confrontation had been more drawn out. Because of that and the murkiness about the main character, I bump this book down from five stars to four. That being said, this is still a sweat-inducing pistol of book ideal for a late-summer read. In Ramesh S. Arunachalam’s thriller, Where Angels Prey, Bob, a Western journalist, arrives in India to write an article about Prasad Kamineni, a micro-finance executive. He teams up with Chandresh, an eager local journalist aware of the darker side of micro-finance in India. Veena Mehra, district magistrate of Ranga Reddy (in Andhra Pradesh), is also conducting an investigation into Prasad’s business. Many of the micro-finance debt collectors, including those employed by antagonist Prasad’s SAMMAAN bank, are conducting loan shark style tactics. They humiliate and threaten borrowers to the point where the debtors, such as a sympathetic widow named Mylaram, commit suicide. Another case unfolds during the action of the book, where Rammaiyya, who was going to serve as an informant against SAMAAN, is mysteriously killed. These cases are a continuation of the ruthless tactics used by money lenders that Maoist insurgents fought against in earlier decades. Micro-finance is a much celebrated concept in the West, and the leaders of the micro-finance movement such as Muhammad Yunus are lionized as heroes ushering in a new era of equity and opportunity in the developing world. This informative book sheds much needed light on a concept that is not so rosy in reality. As narrative fiction, Where Angels Prey could have been improved. The syntax takes some getting used to for an American reader. While the author is a skilled writer, there are grammatical oddities and formatting issues that could have been reduced with a more professional editing job. The present tense verb choice throughout the narrative is awkward. A constant parade of characters gets confusing, especially since many of them are not substantially developed. Just as soon as you learn about a new character and start to get a feeling for him or her, they disappear. It is more of an “ensemble cast” than a book with a single main character. Either Bob or Chandresh is the hero of this financial thriller, but the story probably would have been strengthened by picking one of them to develop further. Veena’s investigation was duplicative of the journalistic one. Also, there is a lot of “telling not showing”: abusive tactics are described in general, rather than experiencing them all through eye-witness accounts in real time. On the plus side, the novel was suspenseful. One wants to learn how it all turns out for Prasad, who is a compelling villain who is also sympathetic in several ways. People who are interested in predatory lending, poverty, international development, and socioeconomics should check this novel out.